Books that make you laugh, turn your knees to jelly and teach you ghost speak! It’s a no brainer. 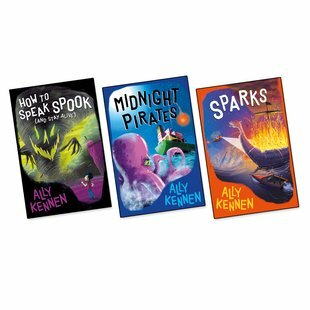 There’s nobody like Ally Kennen for spooky mixed with funny. You know how it is: you’re too busy laughing to save yourself from certain doom. This gifted author made her name with darkly funny teen thrillers. Now these short books give you scares, laughs and wild adventures – all at the same time! Donald talks to ghosts. (Mostly friendly. Not always.) Carla wants to give her grandpa a Viking funeral. And the three kids at the Dodo Hotel have a couple of problems. (1) Running the place. (2) Pirates!